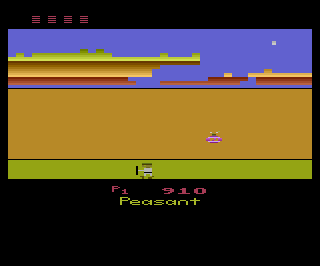 As with any good brick busting game, your main weapon is a deadly power ball which must be thrown at the blocks. Instead of using a paddle, Lu deflects the incoming ball with his staff. As Lu destroys bricks there is a chance that a power token will fall. These tokens grant Lu a variety of special powers. If Lu can make a hole through the bricks and hit the dragon four times he will be taken to the next level. Zig Zag - This token makes the ball move in a zig-zag pattern when reflected at the bricks. The ball moves in a normal straight down motion on its way back however. Magnetic Paddle - This token magnetizes Lu's staff. Not only is the ball now attracted to Lu's staff, but after being hit Lu can actually control the direction of the ball. Unfortunately since this power up is so powerful it only lasts half as long, so use it wisely. Nuke Ball - Perhaps the greatest ancient Chinese secret of all time, this token causes your ball to take out large chunks of the wall each time it hits. This power up makes reaching the dragon a breeze. Mega Paddle - This token makes Lu's staff longer, making it easier to hit the ball. Mystery - As the name implies, the effects of this token are random. The mystery token can give an extra life, give bonus points, stop the blackbird, or speed up the ball. 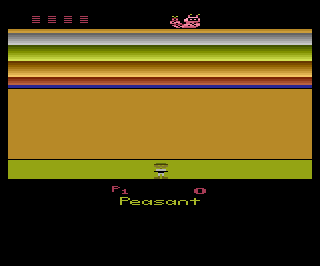 After the first level a new enemy appears to hinder Lu's dream of crushing the dragon. Although the blackbird cannot harm Lu directly, it can block the ball with its impervious body. The blackbird will follow Lu and attempt to knock the ball back at him every chance it gets. The only weapon Lu has against the blackbird is the mystery token, which has a chance to temporarily stop it. 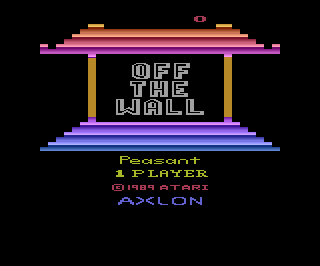 Although Off The Wall may be an Arkanoid clone, it adds just enough new twists to make it fresh and interesting. 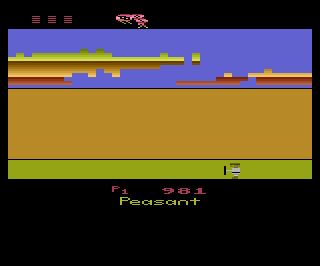 Off The Wall was part of Atari's last wave of new releases for the 2600 before the decided to retire the system for good. 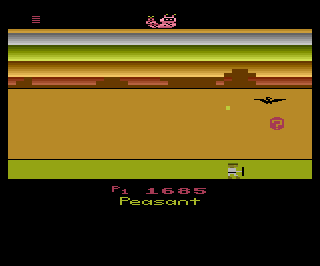 Although it may not have been able to compete on a technical level with the systems of the day, games like Off The Wall proved that there was still a lot of fun to be had with the old 2600.